This MOEN handheld shower has an attractive chrome finish that is made to last. It provides efficient water pressure, and has a 4 in. diameter spray area. It conserves water but still delivers performance. MOEN sets the standard for exceptional beauty and reliable, innovative design. 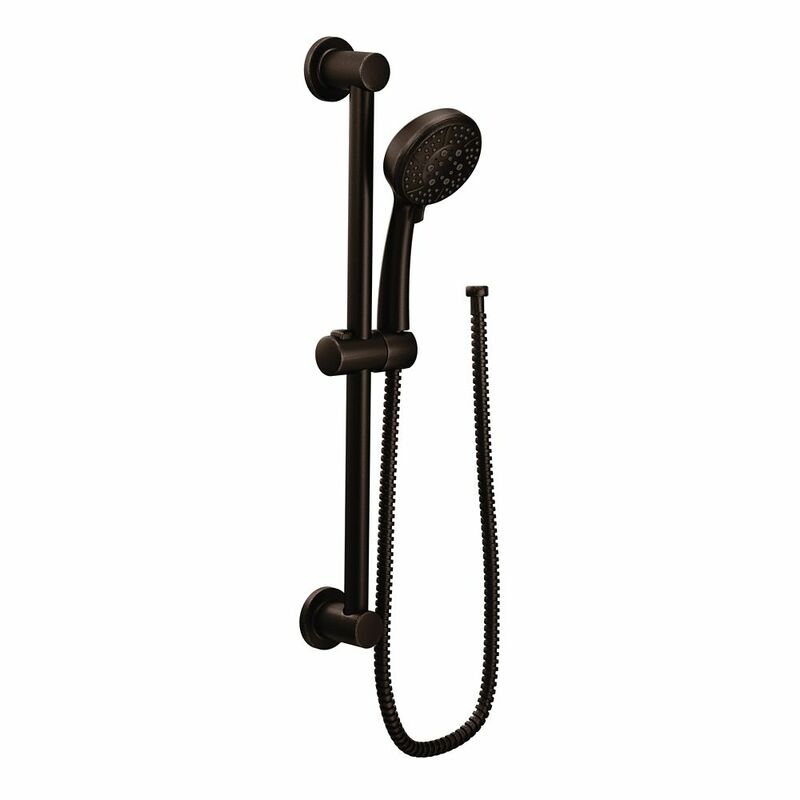 4-Spray 4 inch Eco-Performance Handheld Handshower With Slidebar In Oil Rubbed Bronze From finishes that are guaranteed to last a lifetime, to faucets that perfectly balance your water pressure, Moen sets the standard for exceptional beauty and reliable, innovative design. 4-Spray 4 inch Eco-Performance Handheld Handshower With Slidebar In Oil Rubbed Bronze is rated 4.1 out of 5 by 38. Rated 4 out of 5 by Patricia from I would have like the force of at least one... I would have like the force of at least one spray setting to have more force when used. Rated 5 out of 5 by Stash from This device added a new dimension to my shower. It is completely adjustable, looks good, and work... This device added a new dimension to my shower. It is completely adjustable, looks good, and works even better. I highly recommend the Moen Eco-Performance handheld Handshower with slidebar in chrome. I have purchased a second one for my friend. Rated 1 out of 5 by KK from Horrible. Made out of plastic. I will be returning it.... Horrible. Made out of plastic. I will be returning it. Rated 1 out of 5 by Fedup from Didn't come with the fitting to connect the sprayer hose to the wall outlet even though the pictu... Didn't come with the fitting to connect the sprayer hose to the wall outlet even though the picture shows it. Went back to review what I had bought to read the fine print that states "Drop ell (A725) sold separately". Similar Moen products don't show this fitting in the picture so I assumed the one I bought which showed the fitting in the picture would come with it. VERY DECEIVING! Rated 5 out of 5 by Cyn from Works great! Nice rain shower head & adjustable pressure positions. Works great! Nice rain shower head & adjustable pressure positions. Rated 5 out of 5 by HomeDepotCustomer from Yes they are just what we were looking for!!!!!... Yes they are just what we were looking for!!!!! Rated 5 out of 5 by MTMP from Haven’t used this shower head much yet, but so far,... Haven’t used this shower head much yet, but so far, water pressure is great coming from it!